After sharing a pointedly captioned snapshot of her husband and their daughter, Blue Ivy, a few weeks ago, Beyonce decided to get a bit more explicit. On Saturday, she shared a photo of herself wearing an oversized jersey without pants - and the jersey just happened to bear the No. 4 on its front and "Carter" on the back. 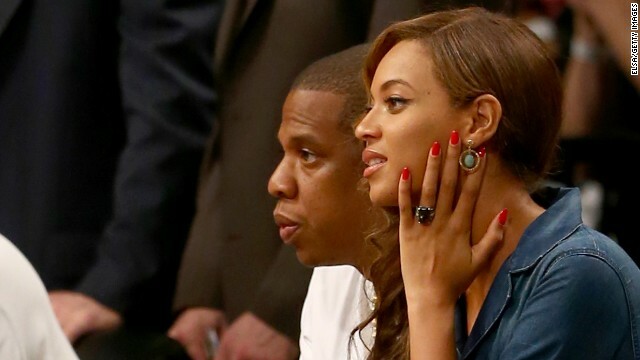 The name is a clear nod to Beyonce's married moniker, as she's technically Mrs. Shawn Carter. And as devoted Beyhive members know, the number four carries a lot of significance for Beyonce and Jay Z; they're born on September 4 and December 4, respectively, and tied the knot on April 4. After the wedding, Beyonce got the Roman numeral "IV" tattooed on her ring finger, and it seemed to be a damning sign of trouble when she appeared to have that tattoo removed. But according to her recent Instagram photo, Bey is still a fan of "four" - and she's still proud to wear her husband's last name on her back. The photo's caption? Sealed with a kiss. Another black woman trying to be a white woman. Her music is bubblegum crap and her same ol tired dance moves have been done a thousand times. Diana Ross had talent, Beyonce is all Hollywood flash, smoke and mirrors. Another? LOL. Get a life. She wouldn't be nearly as successful if aspiring to be Patty Mayonnaise was her ambition in life. She's hot – that said, I agree with the bubblegum reference. I weep for the generations who think her performances are great. But, their opinions are their own, as are mine. It just turns out that I'm right.